One of common and complex request involving Absence Quota is carry forward from current year to next year. There are many concerns and questions posted to find appropriate solution. Thus in this document I will give you a good solution and step by step how to CARRY FORWARD absence quota. Basing on my document, you will be more easier to adapt SAP Time Management to meet your customer’s expectation. However, there are some basic information I have already mentioned in another documents, such as: grouping Personnel Structure (EE group and EE subgroup), Enterprise Structure (Personnel Area and Personnel Sub-Area), Grouping for Time Recording and the way to generate absence quota by using Time Type, so I will not re-write it again. Please look at link Absence Quota basing on Working Date. 1. Yearly Absence Quota is 30 days. 2. Generate 2.5 days (30/12) per month for employee at the last date of month. 3. Start available: Hiring date or 1st Jan. End available: end of year 31st Dec.
4. If remaining >= 10 days in this year, 10 days will be carried forward to next year. 1. Time Type 9D50 will be stored value to generate Absence Quota. Whenever Time Type is not initial, Absence Quota in IT2006 will be created automatically when accomplishing run Time Evaluation PT60. – Clear 9WSL immediately (to be sure that duplication 9WSL will not happen). 2. Time Type 9WSL check whether remaining Absence Quota bigger or equal 10 or not? If it’s exactly, number 10 will be inserted into Time Type 9WSL and 9WSL is a bridge to bring this value from current year to next year. Note: create Time Type 9WSL 1 time per year, after accomplish generated Absence Quota on 31st Dec. So 9WSL exists only from 31st Dec to end of Jan next year. Why? because whenever last of month is coming, 9D50 will be inputted value and 9WSL will be blank So from Feb to Dec, 9WSL always equals 0. These are important points. From now steps by steps in configuration V_T559L and Time Schema also will be mentioned here. As mention at the beginning, the Grouping I will use here: EE: 2, PA: 09 and Time Recording: 01. It’s only used 1 time per month so it’s configuration is really simple. Just save as day balance. Activate “Transfer previous year”. Without choosing this function, whenever 1st Jan comes, value in 9WSL will be blank. It means value calculated on 31st Dec will not carried to the day after – 1st Jan.
With grouping above, there are steps for configuring in Table view Automatic Absence Quota Generation. 3.1. Base Entitlement tab: of course it’s will be assigned to Time Type 9D50. 3.2. Transfer tab: it’s important tab. Specifies the time at which the accrual entitlements are transferred to the Absence Quotas infotype (2006) to be made available for deduction. As the absence quota has to created monthly (at the last day of every month), so “Per time Evaluation Period” is necessary. If you choose “Per calendar year”, assuming that from Jan – Nov, employee has 2.5 days Sick Leave every month, but when you open IT2006 in PA20, you cannot see Sick Leave. Why? because Transfer time to IT2006 is Calendar year, it’s only transfer value in Time Type 9D50 to IT2006 on 31st Dec.
Co-operation with Validity/deduction interval in index 3.3. It will help us accumulate Absence Quota monthly into yearly. Begin Date : Calendar Year (Start) => normally it’s hiring date in 1st year, and 1st Jan from second year. End date: Calendar Year (End) => always 31st Dec. Begin Date : Start of validity interval: it’s Calendar year (chosen last step): => hiring date or 1st Jan.
End date: End of validity interval: it’s Calendar year => always 31st Dec.
Start 01.10.2011 – end 31.12.2011, Number 2.5, deduction: Start 01.10.2011 – end 31.12.2011. Start 01.10.2011 – end 31.12.2011, Number 5.0, deduction: Start 01.10.2011 – end 31.12.2011. Start 01.10.2011 – end 31.12.2011, Number 7.5, deduction: Start 01.10.2011 – end 31.12.2011. NOTE: you have to insert PCRs in order as same as I have done here. CUMBT: update value of time type in database. 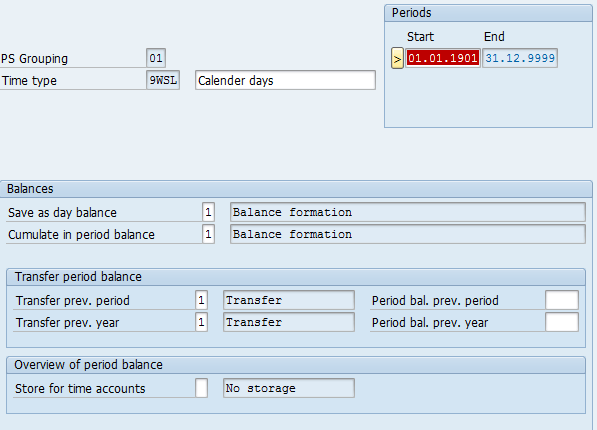 QUOTA: update absence quota and create new / modify records in IT2006. Next, check 31st Dec by ZI51, it’s correct, ZW51 will be call to update value for Time Type 9WSL. After that CUMBT must be call again. HRS=CZPLEL Get value ZPLEL in V_T511K, it’s 30. HRS+M9WSL Plus Accumulate value of 9WSL into HRS. if suppose employee want to take leave in jan first week on in between 1 to 30th jan how can he take. So can you provide me a solution in my case where CF quota of Dec shld accquire on 1st jan and not on 31st jan.
How to change in your pcr please guid me. As you can see, the deduction period is same year, so employee’s only available in this year 🙂 Eg: absence quota in 2012 is 20 days(I assume), and in 2013 until now it’s still 0, so employee CANNOT apply corresponding Leave in 2013, but he can request a leave request in 2012. With your concern, I think your case is: from 1st-Jan to 30th-Jan, employee takes a Leave request in previous year, right? So don’t worry, whenever Time Data changed, Time Evaluation will re-run from that day (because SAP will automatically modify the PDC recalculation in IT3), so the value to carry forward will be decreased 🙂 eg: on 15th Jan, employee raised a Leave Request from 25th-Dec -> 30th-Dec, Time Evaluation (PT60) will re-run from 25th-Dec until system date. Hope you are clear now! I am using TM04 Schema and my golive went on Dec 2012 now i want the legecy absence quota to be carryforward to jan but when i run pt60 its picking on jan 31st in test mode and in live i think i have to wait till the 31st jan comes to activate in 2006 the balance CF with general leave of 1.5 for me as we have 18days leave per yr.
05.12.2012 to 10.12.2012 for jan month. If yes i have a zreport where i store total working days of that calander period so how i it get reflect. I just need you help in how to generating quota on jan 1st insted of 31st from you logic could youhelp me on this because your document is smiler to client req. In Schema: as you can see in Time Schema, I inputted PCR ZW6C after condition EOM, you just create 1 PCR check it’s the first date of month or not 😀 and insert ZW6C. As you said i have created new pcr and added as you said its wroks for 1st jan quota generation. Grate job woody thaks a lot ? It’s working now isn’t it Hatward ? I have one requirement where when i run PT60 and generating quota program should check IT0041 where i have maintained D1 as date of joining date and run pt60. Condition: if emp total calander days is more that 240days the quota should generate if not sys should not pick employee at the time of running pt60 for perticular quota. Could you guide me how to do it. Your request is really easy. Look Schema – useful links & T-Codes you will find useful information to control Schema and research Absence Quota wiki. I have a same scenario which you explained above..
2.5 days is not getting generated & configured same thing in my system what u done above. Can you please help me we are using + management.. I thank you for posting this wonderful document. It has helped me so much in configuration. And finally your Personal Support to resolve my Quota carry forward issues. It is such a wonderful document. Good going… Keep posting….. Thanks for providing excellent stuff and i’m looking for a document about positive management process. Most important is Schema & PCR, if you are clear both of big topics, you can control Negative and positive (as SCHEMA & pcr are core to process Time). I have a scenario:30 PL Quota per annum (2.5 per month) but at the end of the year only 50% of the accrued quota is carry forwarded to next year and up to a maximum of 90 days. First year am able to carry forward 50% of accrued quota; but am unable to add 50% of accrued from 3rd year. Need help..
And also some light on generating quota through time evaluation 30 EL per annum if employee has 240 days physical attendance except for LOP/ LWP. Why you have problem from 3rd year and what is the problem? For quota generation what is you accrual period? Will you generate 30 at end of year or you would generate it monthly for example? If you generate it monthly would you consider 240/12 as attendance per month or what is your scenario? Anyway, for quota generation you need a time type to count the attendance days and you should put this time type “Accrual entitlement” tab of “Selection rules” section of V_T559L. Put it in “Period balance” and select “Pro rata calculation”. You need and base entitlement also which can be 2.5 per month or 30 per year. I dont understand what u meant that you could not forward from 3rd year onward 😕 Just same logic will be run again on the last date annually 31st Dec. Please run your Time Schema in display log mode and check step by step carefully. Anw plz note you have capping is 90 days, I think in your time schema, there is some special logic (PCRs eg) to check this condition. About counting 240 days annually, you can refer my document: Absence Quota basing on Working Date If you are very clear this article, you will find very easy to implement your condition in system. Thank you Woody. This is a wonderful knowledge document. Is there an optimal way to bring forward the negative leave balances of previous years into the current year? Executing retro Time Eval (say) from year 2010, might be risky especially if there are around 1000 employees. Thanks and this is very important for Time Management. For your case, I think you have to use LSMW to update data into IT2013 (Quota Corrections) to modify Quota directly (of course need to run Time Evaluation 😀 ). Thanks for your document, it’s really helpful for my scenario. I have done the most of the configuration, when I test, it’s calculating wrong in some cases, Please find below details and help me out for the same. Quota generated till December-2012 correctly. 21 days from 2012 and 1.75 = 22.75 days Jan-2013 Quota. When Running quota in the month of Feb-2013. Quota Calculating incorrect. It should 22.75+1.75 = 24.5 Days. but it’s generating 45.5 days . Hope you can control Time Schema soon. Test it once and still not resolved then revert. As per my client req 2.75 days/month quota should get accrued. My emp joins on 01.04.2013 and I executed TM till 01.01.2015. Upto 31.12.2013, he accrued only 24.7, it’s correct. But in next year, on 31.12.2014 he accrued 73.00, which is wrong. I put a check for 40 days quota. Only 40 days will get carry forwarded. Actually it is adding up 33+24.7= 57.7 > 40, then it is adding 40+33= 73. But it should only check 24.7, as it is < 40, it got added added as 57.7. Next year 01.01.2015, he should start will 57.7 days leave only. not 73. Pls help me to solve this issue. I changed in my quota config a bit and it’s working fine now. I have another issue now…. I generated quotas for next 2 yrs and their deduction period is from 01.01.2015 to 31.12.2015 (validity: 01.01.2014 to 31.12.2014) and (validity: 01.01.2015 to 31.12.2015) deduction period: 01.01.2016 to 31.12.2016. Every year it is accruing 33 days. My emp joins on 01.04.2014 so first year only 24.7 days were there. I have updated 2001 from 01.05.2015 to 01.06.2015 and remaining quota in 2015 is now 0.75. Next time I executed TEV for next year as mentioned above. It is showing 57.7 days (24.75+ 33) at the end of the year. Ideally it should take 33+ 0.75 (which is remaining now). It is not taking remaining balance. Is it happening because I am executing this TEV for future date? Pls suggest. Yes I guess so. You are using Remaining Quota up to key date (for you case maybe it’s 31.01.2015. Key date is the date you are running in Time Schema to generate Absence Quota). You can check more in PDSY => operation time => HRS => find more F (get data from IT2006). Good luck. Btw I’m very happy when u can resolve the previous issue 😀 It’s good way to get independent and self-confident. If scenario is like Employees, joined in 04.2010 can max entitled 300 leave and if joined after 04.2010 can entitled only max 60 leave but time evaluation run from 04.2012. So how we can configure that? Please see more detail in T-code. Basing the return value from the operation, you can know who join before and after your Flag Date (e.g. 1-Apr-2012). 05 is the Date Type. In which line I have to insert my PCR in Schema? Check in your thread. I have replied on that. Annual leave entitlement is 26 in calendar yr, 2.167 accrued monthly basis after 1month of joining and 5 days of the leave balance on last date of the year will be carried fwd to next year and rest will be encashed. I am not clear what are you concerning now? In my document, there is a sentence: “4. If remaining >= 10 days in this year, 10 days will be carried forward to next year”. From my understanding, your case only carry maximum 5 days, isn’t it? So there is no difference, you just update constant from 10 to 5. Thanks. Woody, Thanks for the reply. Yes that part is clear. I though your leave absences in 2006 generated monthly and deduction period is monthly as well. So of course end of Dec, only Leave Absence in Dec is effective. You have to clear understand how to generate Absence Quota by configuration in T559L as well as how to set Deduction Period for Absence Quota. You have missed some key steps, please check carefully again. Good luck. Nov 3.0 days (deduction period is within Nov). => of course end of Dec (31.12) only 2.5 days in Dec is effective. Thanks for the nice document. By using your solution, i have configured Quotas Carry forwarding in my project. Everything is fine but in my project. 16 /12 is coming 1.33000 accumulating all this to pB Time type its coming like 15.96000. I need your support to make it 16 round figure. where should i insert the roundhr01 as per v_t559r table. Your support in this is highly appreciated. You can simply archive this by using rounding rule. 1st define your rounding rule and assign in your configuration table V_T559L or in time schema. Take your time to see the operation ROUND in T-code PDSY, it may useful for you or try to looking for in SCN where there are a lot of entries about the topic already. I have a requirement with the client where its based on the date of hire the PLD entitlements would take place. The PLD entitlement is set in the table V_T559L .As per the rule the entitlement is set as “5” from 01.01.2003 to 31.12.2014 and its “3” from 01.01.2015 to 31.12.9999. The PCR is also written for generating absence quotas based on the entitlement thro PT60. However client has asked to put an additional logic to look into the hire date . If the hire date is before 14.06.2014 then it will generate entitlement as 5, but if the hire date is after 14.06.2014 then it will generate entitlement as 3. Could you please let me know where to put this logic for hire date before the rule is called. You can achieve this with standard operation HRS=YSXA have a look at it. Glad to hear that it is working in your system know. Thanks for your post, it’s really helpful. I am newbie to SAP HCM and I am struggling with some payroll requirements in Vietnam. I still have some problems that need to be clear. Could I write you to ask for help? 1. Kind of tax: fix 10% for short term, or following rate table: 9M 10%, 15M 15%, etc. 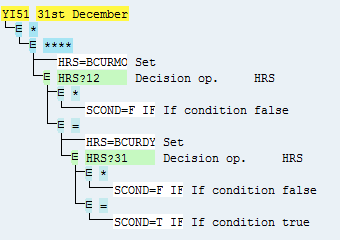 You have to deeply understand some standard operations & functions => please find SAP document in T-code PDSY or press F1 key while checking schema / pcr in PE01 / PE02. 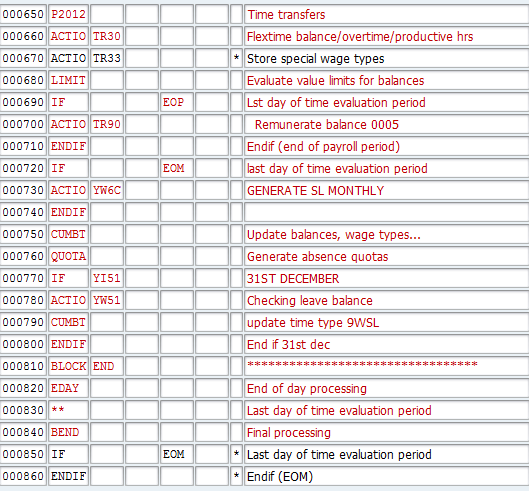 If you face any issue, try to read document again and then run payroll in display log mode. It is best way to resolve the problem in payroll. If you need help, just post on SCN forum, for sure there are others functional consultants supporting you. Thanks for sharing. But what do you mean customized infotype? In other words, how can you import data from exel file into SAP HR? In case SAP has not provide standard infotype to record some mandatory information yet, we may need to develop some new infotype which is called as customized infotype. There are many wage to import excel to SAP HR, you can try through LSMW or you can build a new program by yourself, you can refer in SCN where includes a lot of discussions and documents already. Good luck. You can get your answer on the belw link. Go through below link it may helps you to build your logic. Is there any way out if we are not using Time Evaluation or using -ve Time management? Can you please tell the userexit name so that I can help ABAPer ? In ur PCR u r checking if the remaining days are >= 10, if yes, then u are carry forwarding 10 days to next calendar year. In my case, I should be forwarding all the remaining days to next calendar year. What should I be doing for this? Say for Ex: My total PL per year is 25 days and on 31 Dec 2014, remaining PL is 20 days. so from 1 Jan 2015 to 31 Dec 2015, My total available PL should be 25 + 20 (20 which are not used in 2014) = 45. Could u plz help me out in this? You just update the pcr ZW51 accordingly. Removing logic to check with 10. That’s all. Thanks. Thanks Woody, I ll check and shall revert you. I have a scenario, i have generated 2.5 days per month .But if employee not work of his actual calendar days the quota should be deduct from the 2.5 days . I am using your configuration as you mentioned in your post. Bur I need a little more help from you. In my project we are using RPTIME00 to accrue earned leave quota. But as we are updating outstanding leave balances as on cut off date, and then upon executing the time evaluation it is actually over writing the cut off balance. In time evaluation, quota is getting accrued 2.75 days per month. If I execute RPTIME00 for month of April , as this is our Go-Live, it is over ridding the previous entry and now it is showing an entry with only 2.75 days with the same validity and deduction period mentioned above. Ideally it should have added the values and showed 102.75. Isn’t it? Please help me to overcome this issue? I am not quite sure why you design like that. 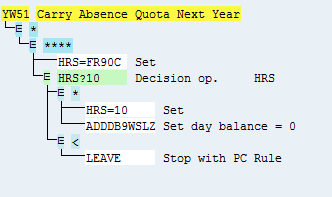 For leave balance on cut of date (it means it is calculated outside SAP), you should create manually via LSMW, etc to update IT2006 with different Absence Quota e.g. 99 Golive Annual Balance. The new absence quota start generating from Go-live date should be a new one, such as 01 – Annual Leave. With the approach it will help you to avoid the issue and easy to track which record created manually and which one generated via Time Schema. in my case, the validity period is 1 year since hiring date. Your requirement is very tough, but I thought it can be done in Time Schema. By using HRS=Y, you can calculate when it’s exactly 1 year / 2 years / etc your employee joins the company and decide to carry forward or not. To be very accurate, you should calculate how many days in Feb so you can decide whether 1 year 365 or 366 days. The operation check the value in IT41 so you can store the Hiring Date into the infotype. For more information please check SAP document via T-code PDSY. i tried this scenario, quota is getting generated but carry forward is not happening, please help . Could you please share your pcr which is to handle the same purpose with my pcr 4.2: PCR ZW6C? Anw plz to check your configuration for time type 9WSL correctly or not? Thanks.